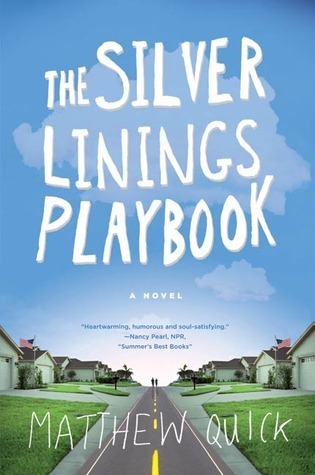 An enchanting first novel about love, madness, and Kenny G. The Silver Linings Playbook is the riotous and poignant story of how one man regains his memory and comes to terms with the magnitude of his wife’s betrayal. When Pat meets the tragically widowed and clinically depressed Tiffany, she offers to act as a liaison between him and his wife, if only he will give up watching football, agree to perform in this year’s Dance Away Depression competition, and promise not to tell anyone about their “contract.” All the while, Pat keeps searching for his silver lining. In this brilliantly written debut novel, Matthew Quick takes us inside Pat’s mind, deftly showing us the world from his distorted yet endearing perspective. The result is a touching and funny story that helps us look at both depression and love in a wonderfully refreshing way. This is the journal of Pat Peoples, beginning with the day he is released from the mental hospital, in which Pat refers to as 'the bad place'. Pat is in his thirties, married, and medicated. After an incident in which Pat's estranged wife was unfaithful, Pat was committed for his angry outbursts and to protect his own mental health, and those around him. His mind suppresses the incident and thinks he's been gone mere months, but it's been a little longer than that. All he knows that is he is determined to start afresh with his now estranged wife, and hearing Kenny G causes violent and tearful meltdowns. Trying to get his life together, Pat meets Tiffany at a dinner party. She's abrupt, rude and propositions him when he walks her home. Pat realises that the newly widowed Tiffany isn't firing on all cylinders. Though a shared routine of a daily run, Tiffany stalks Pat. Waiting for him each day and running a few paces behind, always silent. Pat tries to mend bridges with his aloof father, who barely speaks to him apart from on game day. He takes his medication as to not upset his mother, and reads classic novels and exercises religiously, all part of his journey to reunite with Nikki and learn to be a better husband. To give up watching the bonding football experience with his friends and family. But hey, anything for Nikki right? Tiffany, not without problems of her own, tries to snap Pat out of his delusions, but Pat only ever sees the silver linings and Tiffany is determined to change that. This book wasn't at all what I expected. I assumed it would have been practically the same as the film adaptation, Silver Linings Playbook with Bradley Cooper and Jennifer Lawrence, but it had a completely different feel. The book isn't a funny, romantic comedy. It's quite depressing and sad. Pat's mental health is never discussed clinically, apart from his aggressive tendencies and angry outbursts, you never truly know what the prognosis was that landed Pat in the mental hospital for years. The book also outlines the issues surrounding how people diagnosed with mental illnesses are treated and the effect of the support network. The main theme of the book is relationships, mostly strained. That between Pat and his father, Pat's parents, his therapist, between Pat and Tiffany and with his estranged wife. Pat's inner dialogue isn't that of a man in his thirties, you will find yourself wondering how old Pat really is. At times it is extremely childlike and frantic, almost borderline hyperactive. It felt more as though Pat might have had a cognitive disability, than mental illness. Basically, if your looking for a fun romance, this isn't it. There IS no romance, only unrequited love, from several parties. An intelligent read, but sadly not for me.